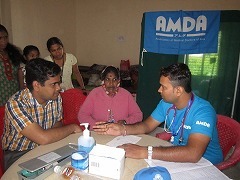 AMDA began its medical relief in Karnataka on 3 September with the invaluable assistance of Dr. Ramachandra Kamath, a doctor of AMDA India and Chief of Community Medicine at Kasturawa Medical College. 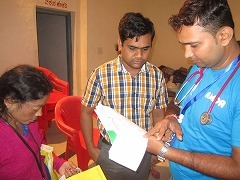 The medical team, which comprised of six members from AMDA Nepal, local doctors, pharmacists, nurses, etc., provided medical care at Mythri Hall, one of the evacuation centres. 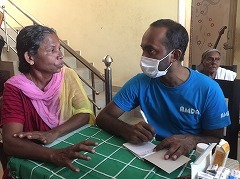 The team saw 54 patients on 3rd September, the majority of whom were suffering from colds and dermatosis. On 4th and 5th, the team investigated the flood and landslide situation in the area. They also visited the district office and local primary health care centre to share their reports regarding the health of the disaster victims. 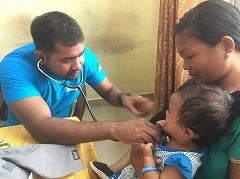 The medical team in Chengannur comprised of around ten members, including: ayurvedic doctors (introduced by AMDA India), doctors from AMDA Nepal, and a driver and laboratory technician from Sewa Bharati, a local cooperative body. 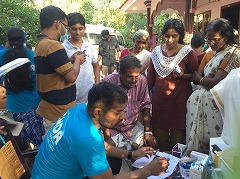 On 4th September, the team saw 140 patients at Venmony Villiage in Chengannur City, where the majority of cases were for lower back and joint pain. They saw a total of 167 patients across two locations in Venmony Village on 5th September. Chronic illnesses such as high blood pressure and diabetes, and joint, knee and lower back pains were the most prevalent cases. There were also those suffering from coughs and colds. On 6th September, the team visited Niranam Village. There, they saw 68 patients. Again, there were many patients with chronic illnesses (high blood pressure, diabetes), and some with coughs and cold symptoms.